SLAP Watch makes a number of attractive watches, and slap bands for pairing. The coolest and most eye-catching to me, are the animal print models offered. Let us not assume all animal print SLAP watches are equal. I like some of the bands better than others -- as would anybody, no doubt. With that statement of the obvious out of the way, I must really have you going now. Hah! Here in this article are my favority-faves. I like the brown-on-brown look of this slap-dappy watch model. The face of the watch is brown and matches the brown part of the snake-styled silicone SLAP watchband. I could see someone enjoying this watch at a night on the town, or at a fun, animal-themed party. I would rather see a faux-reptile watchband than one made from an alligator, croc, kayman -- or what have you. SLAP has done a good job here, with their "Croc" SLAP watch model. The Croc comes in green, purple -- and even teal! To my taste, I like the purple version the best -- but I have always been partial to purple. Purple Croc SLAP Watch with "Bling"
The zebra print is back again! It is as if it never goes completely out of style. SLAP combined their pink "SLAP Bling" watch face with a black and white zebra band. The result is a fun watch that calls to whimsy and elegance. Perfect, on the fun-loving woman's arm. The silicone used for the "leopard" band of this model gives off a fuzzy look and feel. I checked out this watch at a retailer's display, and I really liked the texture. Can't you just see a teen getting a kick out of this watch! Or a self-assured adult wearing it on a fun night around town! The whimsical feminine companion piece to the Natural Leopard SLAP Watch is this Pink Leopard model. Rest assured, everyone at SLAP Watch knows there are no real pink leopards, but when you have silicone and a color wheel, why stop at what nature gives you? The Natural Leopard and the Pink Leopard may be the perfect "his and her's" complementary watch pairing for a cool, fun couple. The Pink Leopard is available as a smaller, lighter "junior" model, for those who like a daintier watch. Pink Leopard Jr. 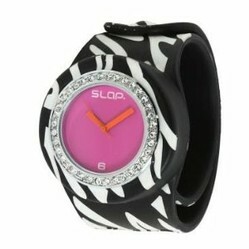 SLAP Watch with "Bling"
Go with Your Animal Instincts -- Buy an Animal Print SLAP Watch! If you have read this far, perhaps an animal print SLAP Watch is now calling out to you. Calm that calling, BUY ONE NOW! I hope you have enjoyed this article on animal print SLAP watches, and I welcome your comments. I don't wear a watch everyday myself, Brenda. I think of these watches as more of a "neat" accessory. I don't wear a watch anymore. I love animal print so I may just have to start wearing one again.